Paul Barber admits there has been interest in Brighton's top players - but the intention is to keep them at the club. The Seagulls have made eight signings since the end of last season, with Barber saying the club have 'strengthened from a position of strength'. Defender Lewis Dunk was one name rumoured to be attracting interest from some of the Premier League's top clubs last season, while Pascal Gross, Mathew Ryan and Shane Duffy were among those to enjoy a stand-out first season in the English top flight. Seagulls chief executive Barber feels Albion have a loyal group but admits top players will always want to play at the highest level. Speaking to the Brighton & Hove Independent, he said: "You always get interest in good players. We've made it very clear our intention is always to keep our best players and that's so far proved to be okay. "But we've still got a week to go (until the transfer window closes), so I don't want to speak too soon. "We're realistic. We know the best players will always want to play at the highest possible level they can. "In club football, that obviously means European football and particularly Champions League. Once you reach those sort of levels, then your ability to play at international level is enhanced. "We're very realistic about that but so far, so good. We've got a good group, a loyal group of players and we're looking forward to the season. "Most of them in this group have either been with us through the promotion challenging years or they've joined us since and enjoyed a good first season in the Premier League. "One of the advantages we have just looking around here now is we're in a great location, we've got world class facilities, we've got a very stable coaching team, a very generous and stable owner and a board that's been together for the best part of a decade. "All those ingredients go towards making the football club as stable and professional as it can be. "That does have an influence on players and when you're in the Premier League, it gives you a status which most players crave. "As I said, there's always another level. We're very well aware of that but it's certainly easier to keep players when you're in the Premier League than obviously when you're not." A number of Albion's squad who helped the club win promotion into the Premier League were regulars last season in the top flight - and are likely to be again this coming campaign. Barber said: "It's always important to try to keep hold of the players who have got you to where you are but at the same time, we're always looking to strengthen. "If you can strengthen from a position of strength, that's the best possible scenario. The only way you can do that is if you keep your top players. 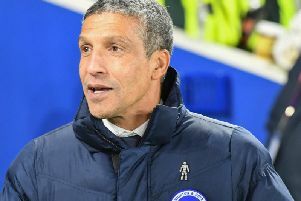 "We're very fortunate we've got a very good group, not just good footballers but good characters and that makes Chris Hughton's life a lot easier because there's a lot of self discipline and a lot of team discipline."